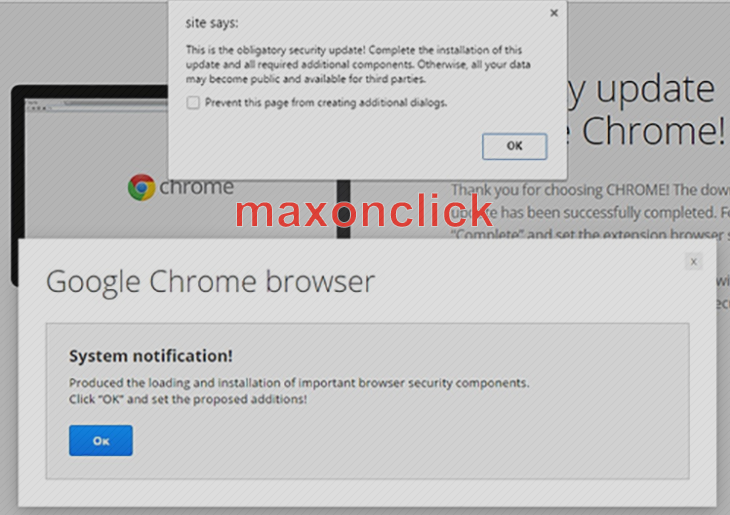 This post contains a comprehensive analysis of the Maxon Click virus issue and provides how-to’s regarding maxonclick.com/a/display.php popups removal. When confronted with a piece of adware like Maxon Click, the average Mac user isn’t very likely to suffer any serious consequences security-wise, but his or her web browsing routine becomes a mess. The above-mentioned app is designed to drive traffic to dubious sites in a highly intrusive manner. It incorporates a persistent add-on into Safari, Chrome or Firefox. This offending extension, in its turn, takes control of the browser settings that determine which pages are returned when specific actions are done on the user’s end, including instances of opening the browser, triggering a new tab, and searching the web via the default search provider. To add insult to injury, this infection can make obnoxious popups go off randomly, that is, without any ad hoc action of the administrator. The malicious URL accompanying these redirects and spoof interstitial ads is www.maxonclick.com/a/display.php?r=, with a string of random digits following it. Interestingly enough, the exact same domain string can return absolutely different landing pages across these incidents. When this rerouting takes place, the web traffic tunnels through multiple URLs that denote ad campaigns, and then eventually halts at a gaming site or a page hosting rogue security updates and junk software like HD Video Player. In some cases, the concomitant popup alerts will keep the Mac user from closing the browser tab unless they click OK and thus authorize the bogus update or app setup. Along with traffic monetization in which Maxon Click is, obviously, involved, its landings also promote other infections disguised as useful applications. Furthermore, the user’s privacy is at risk, because the virus is continuously mining sensitive information, such as browsing history, cookies, operating system details, as well as credentials for various online profiles. It’s important to keep in mind that the Maxon Click virus escorts compound app installations while trespassing on Macs. In other words, people usually fall victim to it after they run the setup of benign software that goes with a bundle of extra programs. These featured offers are installed by default as part of the main solution. This is why deselecting redundant apps in such setup wizards is imperative. Fortunately, even if maxonclick.com/a/display.php popup and redirect virus gets into a Mac OS X environment, it isn’t hard to get rid of as long as you use the best practices of adware removal. When confronted with malicious code like the Maxon Click on Mac, you can neutralize its toxic impact by leveraging a specially crafted system utility. The Freshmac application (read review) is a perfect match for this purpose as it delivers essential security features along with must-have modules for Mac optimization. This tool cleans unneeded applications and persistent malware in one click. It also protects your privacy by eliminating tracking cookies, frees up disk space, and manages startup apps to decrease boot time. On top of that, it boasts 24/7 tech support. The following steps will walk you through automatic removal of the Maxon Click infection. 4. Check whether the Maxon Click virus has been fixed. If the lock screen is still there, go to the Uninstaller option on Freshmac GUI. Locate an entry that appears suspicious, select it and click Fix Safely button to force-uninstall the unwanted application. 5. Go to Temp and Startup Apps panes on the interface and have all redundant or suspicious items eliminated as well. The Maxon Click fraud shouldn’t be causing any further trouble.